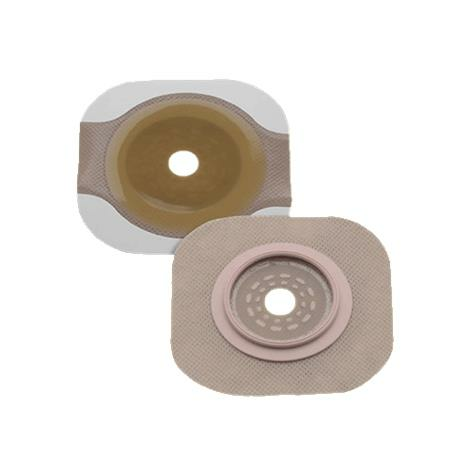 Hollister New Image Flat Cut-to-Fit Flextend Ostomy Skin Barrier With Tape Border protects the skin over extended wearing time from irritating discharge. Flextend barrier is an extended wear skin barrier that is durable and offers high resistance to erosion. It eliminates pressure on tender post operative abdomens with the exclusive Floating Flange. Confidence is assured with the floating flange and provides utmost security with the patented locking system that audibly clicks into place. Color Matching System: To help you select compatible New Image components, every box label is color-coded. First, select the proper skin barrier; then select a matching color-coded pouch (red skin barrier box label is compatible to red pouch box label). Green: 1-3/4" (44mm), red: 2-1/4" (57mm), blue: 2-3/4" (70mm), yellow: 4" (102mm). Skin should be cleaned and thoroughly dried. If a skin cleanser or soap is used, it must be a kind that rinses completely from the skin without leaving a residue. Lotions, oils and powders may interfere with the adhesion of a skin barrier. Skin barriers adhere best to dry surfaces. If the skin is eroded, use a skin barrier powder (for example, Premium Powder). The powder should be applied to the moist areas and then excess powder must be removed. The powder will absorb the moisture. In some cases, a second application of powder may be needed. Some clinicians will use a skin sealant (for example, Skin Gel wipe) to “seal in” the powder. This is a clinical preference but is not required. The use of a skin sealant (Skin Gel wipe) interferes with the adherence of Flextend extended wear skin barrier and will decrease the wear time. If the stoma is active, use something dry, such as a rolled piece of gauze, on the stoma to control the output when the skin barrier is being applied. Remove release paper or film prior to application of the skin barrier. Minimize the amount of touching or contact with the barrier prior to application. Once applied to the skin, the barrier adhesion will improve with heat. Enhance the adherence of the skin barrier by using a hand or fingers to hold the skin barrier in contact with the skin for 30 to 60 seconds. The flexibilty of the barrier can be improved by warming prior to application. One way this can be accomplished is by holding the barrier in your hands prior to the removal of the release paper or film. Do not microwave skin barriers. Wear time is defined as the length of time a product can be worn before failure. Failure is usually the result of barrier erosion or separation of the barrier from the skin. Wear time can vary widely based upon factors such as skin condition, discharge consistency, activity, and climate. The goal is to provide predictable and consistent wear time.